Parisa Elahi is a lawyer at a Human Rights NGO. Parisa’s previous experience includes pro bono work with the Iraqi Refugee Assistance Project (IRAP). Through participation with IRAP, she represented a client who had been denied refugee status, and ultimately presented the substantive points of the client’s appeal at the client’s appeal interview at UNHCR’s offices in Amman, Jordan. She has discussed her work with IRAP in a documentary titled My Beloved Enemy. Parisa has also worked with an Ashoka fellow on the implementation of a renewable energy project that emphasizes local community involvement, education and empowerment. She recently spoke at Georgetown Laws class on Social Entrepreneurship & the Law about her experiences on this project. 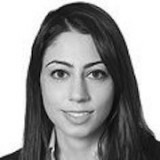 Parisa is also a member of the Iranian American Bar Association Pro Bono Committee.